Collect a sample of water after the first carbon tank2, 3, 4 and test it according to the HiSENSE directions. If the results are positive, a second sample should be taken immediately after the water leaves the second tank. If there is chlorine leaving the second tank, dialysis should be discontinued in the facility. If there is no breakthrough after the second tank, the water can be used but the chlorine level should continue to be monitored after the second tank on an hourly basis until the primary tank is replaced. 2. AAMI Standards and Recommended Practices, Dialysis, 2008 Edition, RD62 - Water treatment equipment for hemodialysis applications. Association for the Advancement of Medical Instrumentation. Arlington, Virginia. 3. NANT Dialysis Technology – A Manual for Dialysis Technicians, 2nd Edition. (2000), page 103, National Association of Nephrology Technicians/Technologists, Dayton, OH. 4. Proper mechanisms for assuring disinfectant concentrations for use in hemodialysis. Nephrol News Issues. 1999 Jun;13(6):18, 23, 27. Arduino MJ. Prior to starting each shift of dialysis patients, test the water after the first carbon tank for the presence of total chlorine3. It is very important that the water system be in full operation for at least 15 to 20 minutes before you take your first test. Test Strip Technique Place a Serim GUARDIAN HiSENSE Test Strip in the strip holder (concentrator). Fill the reservoir in the Strip Holder using a sample of water collected after the first carbon tank. Add 1 drop of HiSENSE Reagent Solution. Allow the water sample to drain from the reservoir (~7 minutes), remove the strip from the holder & interpret the results. indicating that the concentration of total chlorine is at or above 0.1 ppm and should not be used. NEGATIVE for Total Chlorine - The circular Reaction Zone of the HiSENSE Test Strip will be no darker than the surrounding indicator paper indicating that the concentration of total chlorine in the water tested is less than 0.1 ppm. Store bottles of Serim GUARDIAN HiSENSE Test Strips at temperatures between 15°- 30°C (59°- 86°F). The lot number and unopened expiration date are printed on the bottom of the bottle. 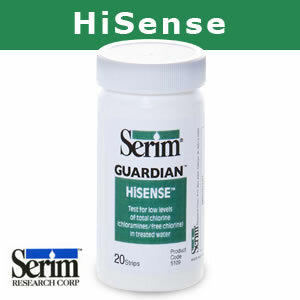 Serim GUARDIAN HiSENSE Test Strips have a 3-month opened use-life.